Home > NASCAR > Dale Earnhardt Jr.
Racecar legend, Dale Earnhardt, Jr., was born October 10, 1974 in Kannapolis, North Carolina. Dale Earnhardt, Jr is a professional race car driver who drives the #88 AMP Energy/National Guard Chevrolet Impala SS in the NASCAR Sprint Cup series for Hendrick Motorsports, and drives in the Nationwide Series part-time for the #5 car for his own team, JR Motorsports. He is the son of the late NASCAR legend Dale Earnhardt, Sr.. He is also the grandson of the late NASCAR driver Ralph Earnhardt and Robert Gee, a legend in the NASCAR shops, the half-brother of former driver Kerry Earnhardt, the uncle of driver Jeffrey Earnhardt,and the stepson of DEI team owner Teresa Earnhardt. Earnhardt, Jr. began his racing career at the late age of 17, competing in the Street Stock division at Concord (N.C.) Motorsport Park. His first race car was a 1979 Monte Carlo that he co-owned with older half-brother Kerry. Within two seasons, the young Earnhardt, Jr. had honed his driving abilities to the point of joining the Late Model Stock Car division. There he developed an in-depth knowledge of chassis setup and car preparation, while racing against Kerry and Dale's sister Kelley Earnhardt-Elledge. Junior ran 9 Busch Series races between 1996 and 1997 for Dale Earnhardt Inc. and Ed Whitaker, respectively, before driving for Dale Earnhardt Inc. in the Busch Series full time in 1998. Earnhardt, Jr. won consecutive NASCAR Busch Series Championships in 1998 and 1999 over Matt Kenseth. Also in 1999 he drove in 5 Winston Cup races in the #8 Budweiser Chevrolet for Dale Earnhardt Inc., then in 2000 he went full time in the Winston Cup series. Earnhardt, Jr. competed for the Raybestos NASCAR Rookie of the Year Award in 2000. His primary competitor for the award was Matt Kenseth. Kenseth outran Junior in the season-opening Daytona 500. Earnhardt, Jr. scored wins at the Texas Motor Speedway and Richmond International Raceway. He also become the first rookie to win the All-Star exhibition race. Kenseth ultimately scored a 42-point victory in the rookie race. Dale Jr. did have a part in recreating one Winston Cup milestone in 2000 when he competed with his father and half-brother Kerry in the Pepsi 400 at Michigan International Speedway. That occasion was only the second time that a father had raced against two sons. Lee, Richard and Maurice Petty had previously accomplished the feat. In 2004, Dale Earnhardt, Jr. won the Daytona 500, six years to the day after his father won his only title in the "Great American Race." On July 18, during an off-weekend from NASCAR, Dale Jr. crashed a Chevrolet Corvette C5-R during a practice for the American Le Mans Series Grand Prix of Sonoma at Infineon Raceway. The car slid off course and hit a concrete barrier during warm-up the day of the race, rupturing a fuel line and causing the car to burst into flames with Earnhardt, Jr. still inside. He suffered second and third degree burns on his neck, chin, and legs partially due to not wearing a protective balaclava with his helmet. The burns prevented him from finishing two races where he was replaced by Martin Truex Jr. and his DEI teammate John Andretti in the middle of the races. In the fall, Junior became the first driver to sweep a weekend at Bristol by winning both the Busch race and Cup race in the same weekend. 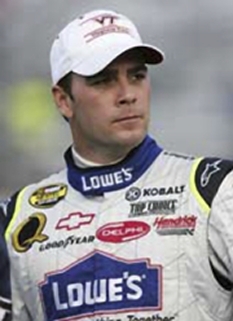 He was able to qualify for the NASCAR ten-race playoff, and had his fifth NEXTEL Cup win of the season (a career high) at Talladega. However, he was penalized 25 points for use of an obscenity during the television broadcast, in violation of a NASCAR rule prohibiting participants from using obscene language. That incident, combined with two consecutive DNF's in the playoffs, eventually dropped him out of the running, and he finished fifth in the 2004 NEXTEL Cup chase despite a career-high 6 wins at Daytona, Atlanta, Richmond, Bristol, Talladega and Phoenix. He also picked up his 2nd consecutive Most Popular Driver Award. At the close of the 2004 season it was revealed that Tony Eury, Sr. would be promoted to the team manager position for the DEI corporation, while Tony Eury, Jr. became the crew chief for the DEI #15 driven by Michael Waltrip for the 2005 season. Peter Rondeau, a Chance 2 employee who also helped Earnhardt, Jr. win the Busch Series race at Bristol in August, became the crew chief for Earnhardt, Jr. in 2005. Rondeau served as Earnhardt's crew chief until the Coca Cola 600 weekend when he was replaced with DEI chief engineer Steve Hmiel, who helped Jr. score his lone win of 2005 at Chicagoland in July. Earnhardt, Jr. was eliminated from any possible competition for the NEXTEL Cup championship after suffering an engine failure at the California Speedway. Earnhardt, Jr. was reunited with cousin Tony Eury, Jr. after the fall Richmond weekend, and results improved immediately. For the 3rd straight year, Earnhardt, Jr. took home the NMPA Most Popular Driver Award. In 2006, during the spring weekend at Talladega Superspeedway, Junior and other DEI drivers drove with special black paint schemes on their cars, intended to be reminiscent of his late father's famous #3 paint scheme. On Father's Day 2006, Dale Jr. drove a vintage Budweiser car at Michigan International Speedway to honor both his grandfather (Ralph Earnhardt) and father, who at one point in both their careers used the number 8 car. After rain caused the race to be ended early, Dale Jr. finished 3rd with Kasey Kahne winning the race. After 17 races in the 2006 season, Dale Earnhardt, Jr. sat 3rd in the championship standings with one win, coming at Richmond in May 2006. During the race at New Hampshire, Dale Earnhardt, Jr experienced the second engine failure of his 2006 season, ultimately leading to a 43rd place finish. Following New Hampshire was the race at Pocono, where Junior was running in the middle of the pack when he crashed in turn 2. These two events catapulted him to 11th in the points standing, out of the Chase for the Cup. At Indianapolis Motor Speedway, Junior and his crew made a critical decision to stay out on the final pit stop to get a much needed top-ten finish to move him up to tenth in the points. Dale Earnhardt, Jr. made the 2006 Chase for the NEXTEL Cup after finishing 17th in the Chevy Rock and Roll 400 at Richmond International Raceway on September 9, 2006. His points position going into the Chase was 6th. Earnhardt, Jr. finished the season 5th in the point standings, 147 points behind leader Jimmie Johnson. Earnhardt, Jr. began the 2007 NEXTEL Cup season by finishing 32nd at the Daytona 500. His first top ten came at Bristol Motor Speedway in the Food City 500 when he finished 7th. His first Top 5 came at Martinsville Speedway in the Goody's Cool Orange 500. He led 136 laps and finished 5th. Jr. collected his third top 10 of the season and his 8th at Talladega Superspeedway with his 7th place performance in the 2007 Aaron's 499. On May 14th Earnhardt, Jr. was docked 100 driver championship points, car owner Teresa Earnhardt was docked 100 owner points, and his crew chief Tony Eury Jr. was fined $100,000 and suspended for 6 races due to the use of illegal mounting brackets used to attach the wing to his car. During the April race at Texas Motor Speedway he drove the last 10 laps in the #5 car of Kyle Busch owned by Rick Hendrick. Although it was gracious of Earnhardt to do so, the circumstances of the situation (Busch stormed out of the car past his crew, believing his car to be damaged beyond repair), and that both Busch's and Earnhardt's contracts expiring at the end of the season, the experience was life changing. On May 27, 2007, Dale Earnhardt, Jr. rode a camouflage #8 car in the Coca-Cola 600 on Memorial Day to raise money for the families of military troops. 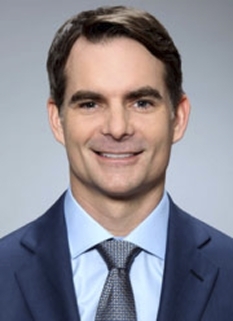 Jeff Gordon, Jimmie Johnson, Greg Biffle, Mark Martin, Ward Burton, Denny Hamlin, Casey Mears, Shane Huffman and Jon Wood also changed their paint schemes for the occasion. Earnhardt, Jr. finished eighth, after leading with seven laps to go, but Casey Mears finished with the win. Dale Earnhardt, Jr #8 Sharpie Busch car at the Sharpie display at the 2007 Ford Championship Weekend at the Homestead-Miami Speedway.On August 5, 2007, Dale Jr. earned his first pole position in a race since 2002 at Pocono Raceway. Although Kurt Busch won the race, Earnhardt had a dramatic comeback to finish second after spinning out and experiencing shock troubles. Earnhardt led for eight laps before Busch took over. On August 12 at Watkins Glen International, Dale Jr. was making the push into the Top 12 of the Nextel Cup standings from his #13 position. After being at the #2 position during the race, Jr. had engine problems on lap 64 and had to end his race day. After the Glen, Junior tried furiously to reach the 12th spot in standings. However, a resurgence by Kurt Busch and a blown engine during the final race at Richmond ended his Chase hopes.That was Dale's last chance to participate for the Championship at Dale Earnhardt Inc.(DEI). After the 2007 season, Earnhardt Jr. won the NMPA Chex Most Popular Driver award for the 5th consecutive time. Earnhardt, Jr. owns Hammerhead Entertainment, a media production company that created and produces the TV show Back In the Day, which airs on SPEED. Hammerhead also produces "Shifting Gears", a new show on ESPN2. He is partners with a group of investors who are building Alabama Motorsports Park, A Dale Earnhardt Jr Speedway. The track is located near Mobile, Alabama and will feature stock car racing, KART racing and a road course. This will join with his partial ownership of Paducah International Raceway. Earnhardt has also opened a bar named Whisky River in downtown Charlotte, NC in April 2008. Earnhardt also has a candy bar out with Palmer called Big Mo', available in peanut butter or caramel flavors. Recently Earnhardt made his own recruiting division for the Navy named the Dale Jr. Division in honor of his Nationwide Series sponsor. Earnhardt, Jr. has appeared in advertisements for Adidas, Budweiser, KFC, NAPA, Domino's Pizza, Gillette, Enterprise Rent-A-Car, Drakkar Noir Cologne, Wrangler Jeans, Chevrolet, Army National Guard,Polaris Industries ATVs, Tylenol Rapid Release Gels, Champion Spark Plugs, US Navy, Go Daddy, and AMP Energy Drink. 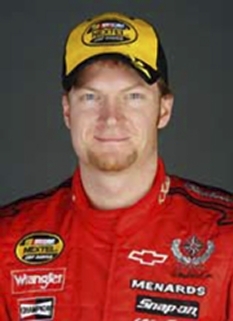 Dale Earnhardt, Jr appeared in the 2006 film Talladega Nights: The Ballad of Ricky Bobby. 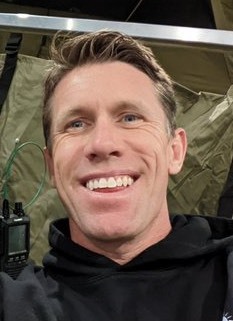 In the movie, he walked up in a crowd and asked Ricky Bobby (Will Ferrell) for his autograph, but told him "don't tell any of the other drivers." He also appears in a deleted scene where he calls Ricky a "dirty liar" and asks him for money he owed him. The #8 car also appeared in Herbie: Fully Loaded in the final race where Herbie overtook him. Dale Earnhardt, Jr appeared on the cover of EA Sports' NASCAR Thunder 2003. Dale Jr. is helping design Alabama Motorsports Park with his brother Kerry Earnhardt, and sister Kelly Earnhardt Elledge. He also won the Chex Most Popular Driver Award for the 5th straight year. DISCLAIMER: PFP Sports Talent Agency does not claim to represent itself as the exclusive agent for Dale Earnhardt Jr.. PFP Sports Talent Agency is a booking agency that represents organizations seeking to hire pro athletes and sports personalities such as Dale Earnhardt Jr. for speaking engagements, personal appearances, product endorsements and corporate entertainment. Fees on this website are estimates and are intended only as a guideline. Exact fees are determined by a number of factors, including the location of event, the talent’s schedule, requested duties and supply and demand. PFP Sports Talent Agency makes no guarantees to the accuracy of information found on this website and does not warrant that any information or representations contained on this website will be accurate or free from errors. We are often asked how can I find out who is Dale Earnhardt Jr.'s agent? To find Dale Earnhardt Jr. appearance fees and booking agent details, you can contact the agent, representative or manager through PFP Sports Talent Agency for speaking fee costs and availability. PFP Sports Talent Agency can help your company choose the ideal sports personality for your next marketing campaign. To hire Dale Earnhardt Jr. for an appearance, speaking event or endorsement, contact Dale Earnhardt Jr.'s booking agent for more information.